Nuffieldite: Mineral information, data and localities. According to several studies, Sb is an essential component for the stabilisation of nuffieldite. Named in 1968 by Paul William Errol Kingston in honor of Professor Edward Wilfrid Nuffield [April 13, 1914 Gretna, Manitoba, Canada - June 10, 2006 Vancouver, British Columbia, Canada] mineralogist of the University of Toronto, Ontario, Canada. 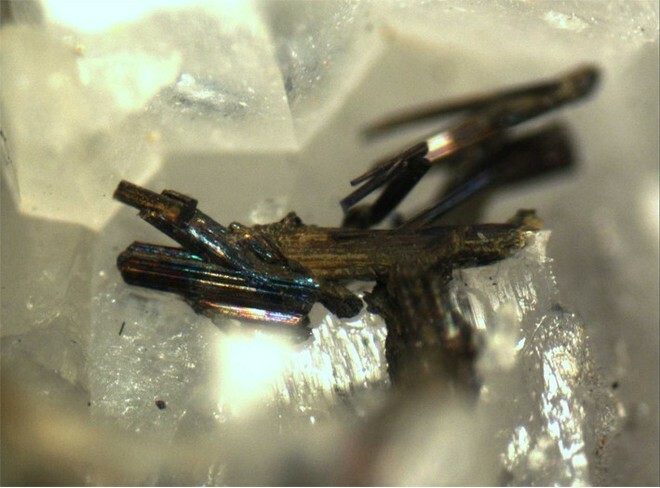 This page provides mineralogical data about Nuffieldite. weak - noticeable only in contact with other grains. 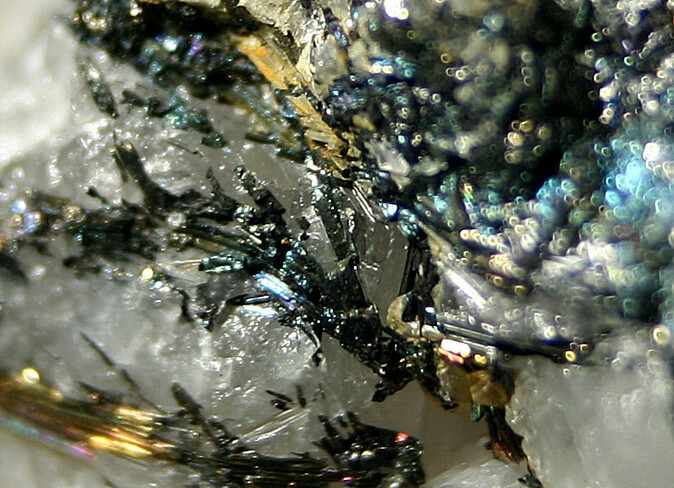 Argentonuffieldite Silver-bearing variety of nuffieldite. Analysis by Voudouris (2005) in fact correspond to Ag-dominant material. Quartz 2 photos of Nuffieldite associated with Quartz on mindat.org. KINGSTON, P.W. (1968): Studies of mineral sulphosalts. XXI. Nuffieldite, a new species. Canadian Mineralogist 9, 439-452. KOHATSU, I. & WUENSCH, B.J. (1973): The crystal structure of nuffieldite, Pb2Cu(Pb,Bi)Bi2S7. Zeitschrift für Kristallographie 138, 343-365. Mozgova, N.N., S.N. Nenasheva, Y.S. Borodaev, and M.A. Yudovskaya (1994): Nuffieldite from the Maleevskoe massive sulfide deposit, Russia. Can. Mineral., 32, 359–364. MOËLO, Y., MEERSCHAUT, A. & MAKOVICKY, E. (1997): Refinement of the crystal structure of nuffieldite, Pb2Cu1.4(Pb0.4Bi0.4Sb0.2)Bi2S7: structural relationships and genesis of complex lead sulfosalt structures. Canadian Mineralogist 35, 1497-1508. Zeitschrift für Kristallographie: 138: 343-365. Pršek J., Makovicky M., Chovan M. & Smirnov A. (2006): A note on chemical composition of nuffieldite solid-solution from sulphide mineralizations (Western Carpathians, Slovakia). Mineralogia Polonica 37 (1), 51-60. Moëlo Y. (1990), Un indice à nuffieldite en Haute-Savoie, Le Cahier des Micromonteurs, n°1, pp: 20-23; Moelo, Y., Meerschaut, A., & Makovicky, E. (1997). Refinement of the crystal structure of nuffieldite, Pb 2 Cu (sub 1.4) Bi (sub 0.4) Bi (sub 0.4) Sb (sub 0.2)) Bi 2 S 7; structural relationship and genesis of complex lead sulfosalt structures. The Canadian Mineralogist, 35(6), 1497-1508. Pieczka A., Gołębiowska B. 2002: Pegmatites of the Szklarska Poręba Huta granite quarry: preliminary data on REE-mineralization. Mineralogia Polonica, vol. 20, 175-177; Kozłowski, A., & Matyszczak, W. (2018). Oxygenic bismuth minerals in the NE part of the Karkonosze pluton (West Sudetes, SW Poland). Acta Geologica Polonica, 68(4). ; Mochnacka, K., Oberc-Dziedzic, T., Mayer, W., & Pieczka, A. (2015). Ore mineralization related to geological evolution of the Karkonosze–Izera Massif (the Sudetes, Poland)—Towards a model. Ore Geology Reviews, 64, 215-238. Radosavljević, S. A., Stojanović, J. N., Pačevski, A. M., Radosavljević-Mihajlović, A. S., & Kašić, V. D. (2016). A review of Pb-Sb (As)-S, Cu (Ag)-Fe (Zn)-Sb (As)-S, Ag (Pb)-Bi (Sb)-S and Pb-Bi-S (Te) sulfosalt systems from the Boranja orefield, West Serbia. Geološki Anali Balkanskog Poluostrva, 2016(77), 1-12. Pršek J. & Ozdín D., 2004: Nuffieldit Pb2Cu(Pb,Bi)Bi2S7 z hydrotermálnych mineralizácií Nízkych Tatier. 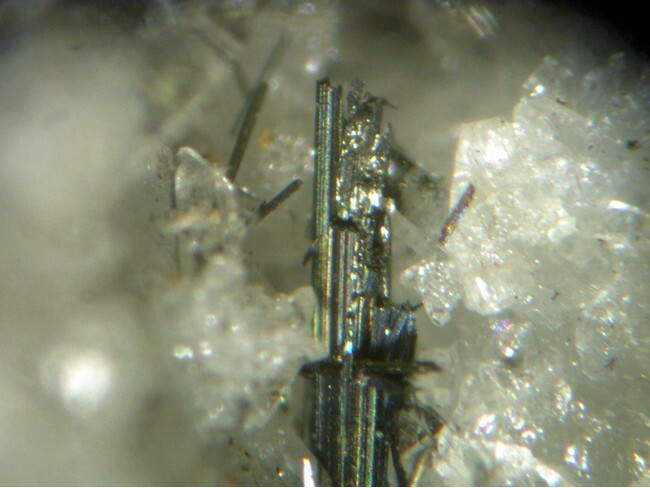 Mineralia Slovaca, 36, 3-4, 273-278.; - Pršek J., Ozdín D., Sejkora J., 2008: Eclarite and associated Bi sulfosalts from the Brezno-Hviezda occurrence (Nízke Tatry Mts, Slovak Republic). Neues Jahrbuch für Mineralogie - Abhandlungen, 185, 117-130. Almodóvar, G.R., Sáez, R., Pons, J.M., Maestre, A., Toscano, M., and Pascual, E. (1998): Mineralium Deposita 33, 111-136.